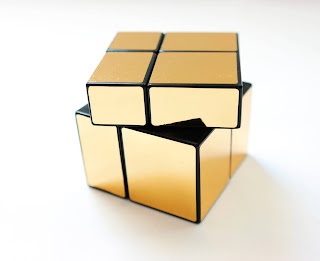 Invented by Hidetoshi Takeshi and produced by Rubik's since 2008, the Bump Cube (also known as the Mirror Blocks) has seen several different variations over the years. From Double Cubes to Siamese Cubes, with different sizes and different colors, the Mirror Cubes are here to stay and to delight the Twisty puzzle fans. The latest in my collection is the Mirror Cube Gold with a 2x2x2 mechanism. Its solving process is similar to a traditional 2x2x2, but it's slightly more challenging, since you solve it by shape instead of colors. As you twist and turn the cube, you'll see that it constantly changes its shape until it's no longer resembling a cube. This one is produced in China by Cube Style - In fact, most of the packaging is in Chinese, but who needs instructions for these? Just enjoy it and have fun. The cube features metallic gold stickers, which gives this extra shiny effect. The stickers seem to be high quality, as they don't peel off that easily, although they are prone to scratch with little effort. Its movement is super smooth, thanks to the pre-lubricated mechanism. I believe it can be used for speedcubing, because it seems to cut corners with ease. The level of difficulty of the Mirror 2x2x2 is rather easy if you're used to Twisty puzzles. Yes, it can be more challenging than a regular 2x2x2, but there's no need to learn super hard algorithms to solve it. Since it's fairly easy to solve, even for beginners, you can try to beat your own times. No need to be a speedcuber to enjoy a little challenge. The Mirror 2x2x2 Cube is a great starting point for a novice to enter the world of the Twisty puzzles. With a different challenge than the classic six color cubes, you can be sure to have your money's worth with this nice cube. When you're confident enough you can go for the Mirror 3x3x3. 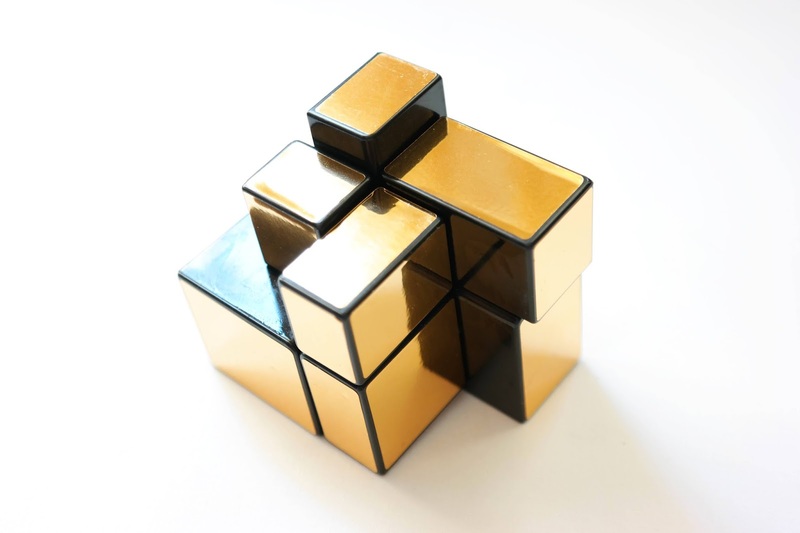 Availability: You can find the Gold Mirror 2x2x2 Cube at PuzzleMaster for $15CAD. If you like Mirror Cubes, you can try these as well. 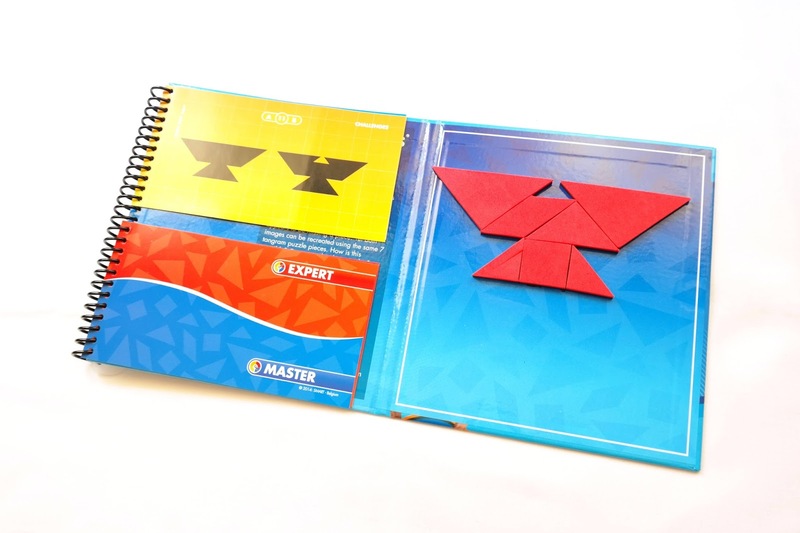 Do you have a knack for Tangram puzzles, the ancient 7-piece dissection puzzle? If so, these two puzzles by SmartGames will delight the most avid fan and put your wits to the test. Tangoes is SmartGames answer to a travel-friendly type of puzzles that are practical and easy to take with you anywhere. 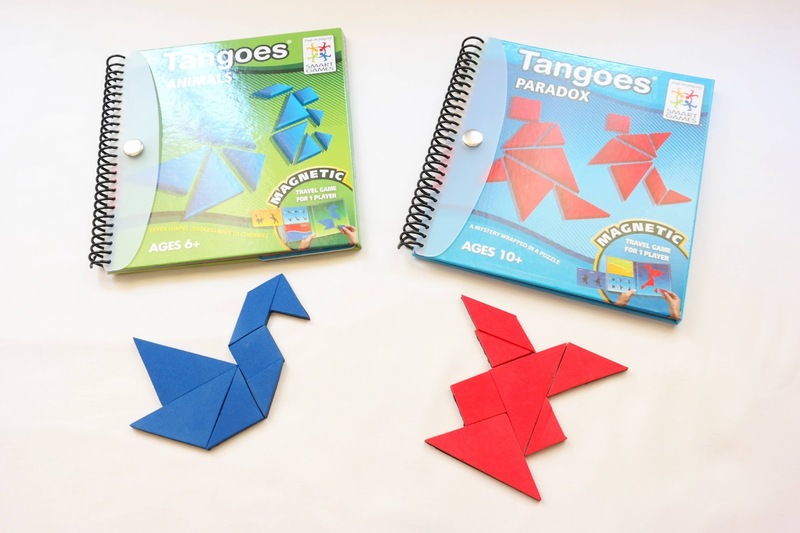 Both puzzles, Tangoes Animals (blue) and Tangoes Paradox (red), have been designed with the utmost care and attention to detail, always with the concept of convenience and fun in mind. What you get is two great products that will appeal to both adults and kids alike. 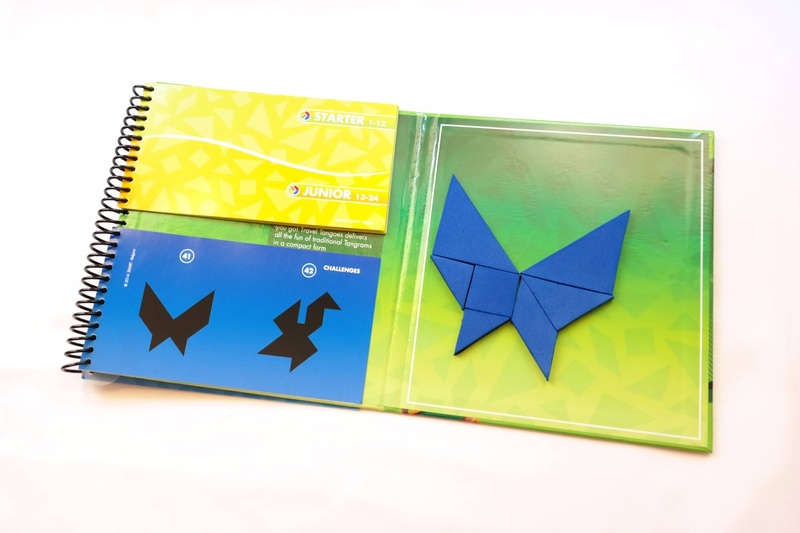 The Tangoes puzzles come in a cool notebook design with snaps lock and spiral rings to keep everything in place. The instructions are printed on the inside of the notebook and the challenge booklet is embedded in the spiral rings, so you won't have to worry about loosing anything. 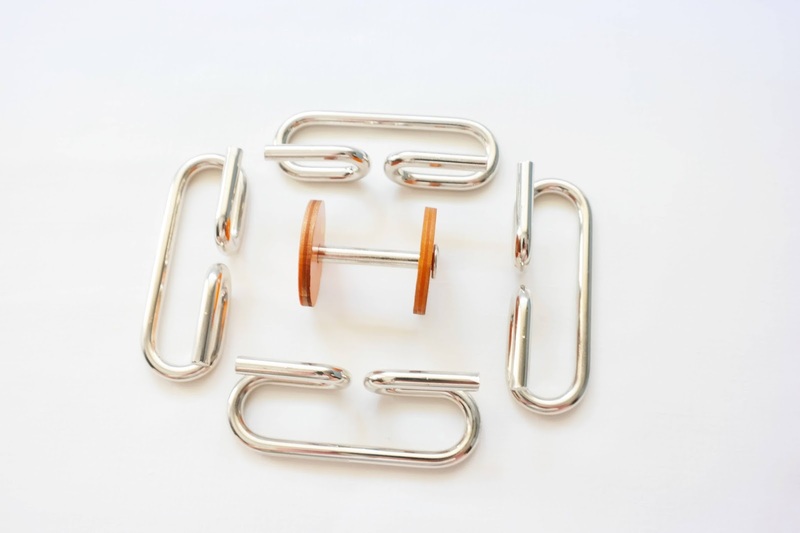 The pieces of the puzzles (seven in each set), the most important component, have been built with a magnetic material and a foam substance to keep the pieces malleable but still resistant and strong. 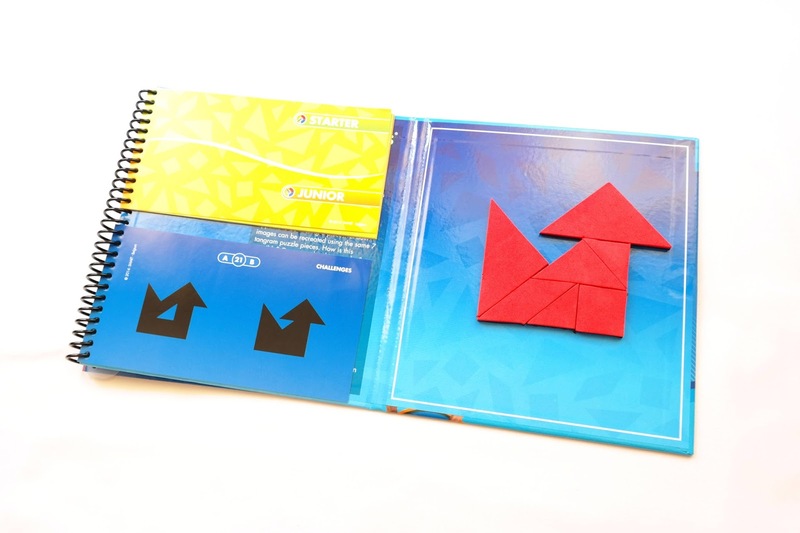 The magnetic pieces stick to the right side of the notebook, thus allowing to play with it on the most uneven surfaces without loosing any piece. Perfect for those long car journeys. Both puzzles come with 48 challenges, divided into four levels of difficulty and grouped in pairs. The challenges start pretty easy, with most of the edges between the pieces showing. As you progress , however, you'll see that most challenges don't show any inner edges. 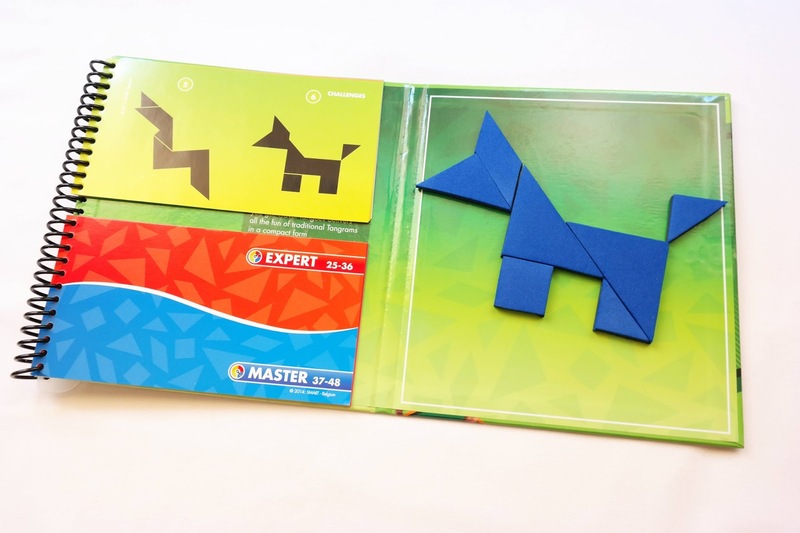 Some of the puzzles can be a little challenging, but since I'm quite a fan of Tangram puzzles, I found most challenges easy enough to breeze through all of them in no time. There's a major difference between the classic Tangram an the Tangoes. One of the pieces, the parallelogram, can only be used with its colored side facing up. There's no flipping it here. This, in turn, will reduce the number of possible solutions for each challenge, even though there's still more than one solution for most challenges. This is true only for the Tangoes Paradox, as the Tangoes Animals only have one solution per challenge. Another interesting fact done in the Paradox puzzle is the inclusion of similar shapes in each challenge. The idea is to have two nearly identical shapes, except for one tiny extra detail. This will make the puzzle more challenging and much more interesting, as you try to assemble both shapes with the same seven pieces. Studying closely the relationship between all the pieces will make this task easier, but until you master this you'll have to sweat a little. I really liked the Tangoes puzzles. They are extremely fun to play with. The magnetic pieces, the convenient design and the additional challenge of the Paradox, my favorite of the two, makes for quite an enjoyable experience. Ready for a Tangoes session? Availability: The Tangoes are available at most major toy and puzzle stores, like Amazon. Glückspiel is a Constantin puzzle that requires a lot of dexterity and hand-eye coordination. German for "Gambling", the name of the puzzle is indeed a gamble if you're not used to disentanglement puzzles. You'll find yourself struggling to put some order into the chaos caused by four mere pieces that just don't like to be close together. Can you reassemble the puzzle after you separate the pieces? The Glückspiel feels very much like a Cast Puzzle. Although a little bigger than the average Hanayama flagship series, the design and build quality is quite similar. 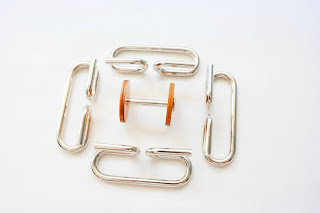 There are four identical pieces, made from thick metal and coated in a silver finish, just like any regular metallic puzzle. At the center of mass is a metal pin with two wooden discs at each extremity, which keeps the pieces from naturally collapsing. The first part of the challenge is to remove this pin and have the pieces move around each other freely. Next you'll need to find a way to separate every single piece from each other. At first, this is not an easy task to figure out, because the pieces are very well entangled - This reminded of the Cast Devil, with a similar solving process. After you have all pieces free from each other, you have to reunite them and form the original shape...And here lies the real challenge. This is a level 8/10 puzzle, and I partly agree, if not for the tough reassembly. I would say around 8.5-9/10. I was able to separate all the pieces within a couple of minutes. It's not hard to figure out how the pieces interact with each other or how they should be separated. The problem, however, is to get all the pieces in the correct orientation and position in order to keep the central pin in place and stable. This took me about half an hour. 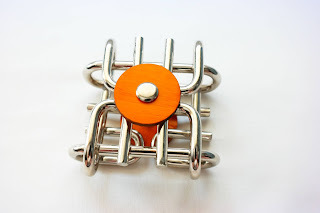 I found it very difficult to find the right orientation of each piece, because even if you know how they should appear when assembled, it's hard to visualize how they should be positioned at the point of entry. This was more or less a trial and error exercise until I found the correct position for every piece. In the meantime, I was also struggling to keep the pieces in the right configuration at all times, since they were always collapsing after almost every slight movement. This is why a great level of dexterity is needed. After this, getting the pin to fit in place is a walk in the park. Glückspiel by Jean Claude Constantin is a little different from his other more popular creations, but it's still a superb design and intriguing enough to give it a try. Again, Constantin proves that he's a jack of all trades who can design and build any kind of puzzle. 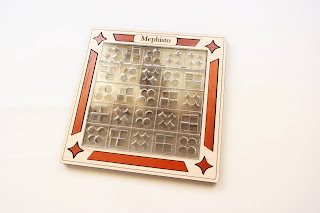 Availability: I got the Glückspiel at PuzzleMaster, but as of writing this review it's out of stock. Check back soon to see if it will be available again. Nevertheless, you can always check out other fascinating puzzles by Constantin. Mephisto. Sounds like a scary name...And it should be, since it's one of the chief demons in German literature. It's a fitting name, because this puzzle is quite a difficult task to achieve. Can you vanquish this mighty demon? 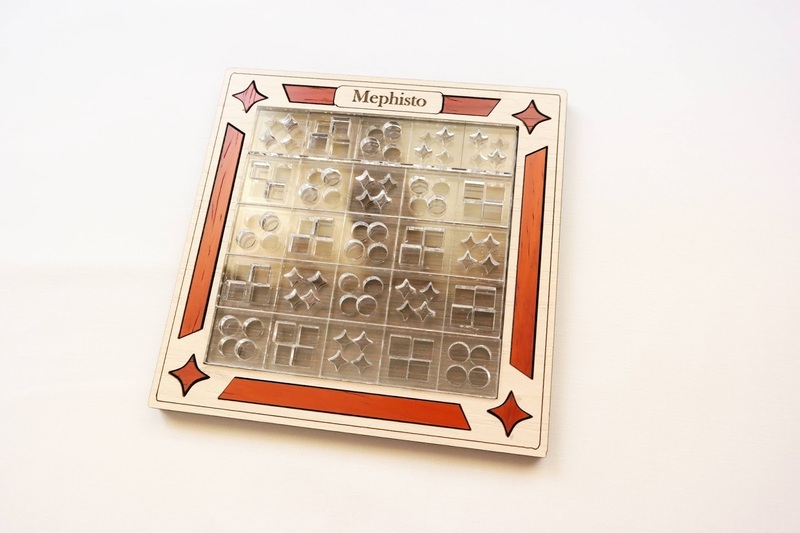 The Mephisto puzzle is made by Siebenstein-Spiele, one of the leading companies in Germany producing wooden puzzles. The company founder, Jürgen Reiche, is responsible for the creative department and has designed almost all puzzles launched by them. He's indeed a very prolific craftsman and his puzzles are the delight of many serious collectors and aficionados alike. 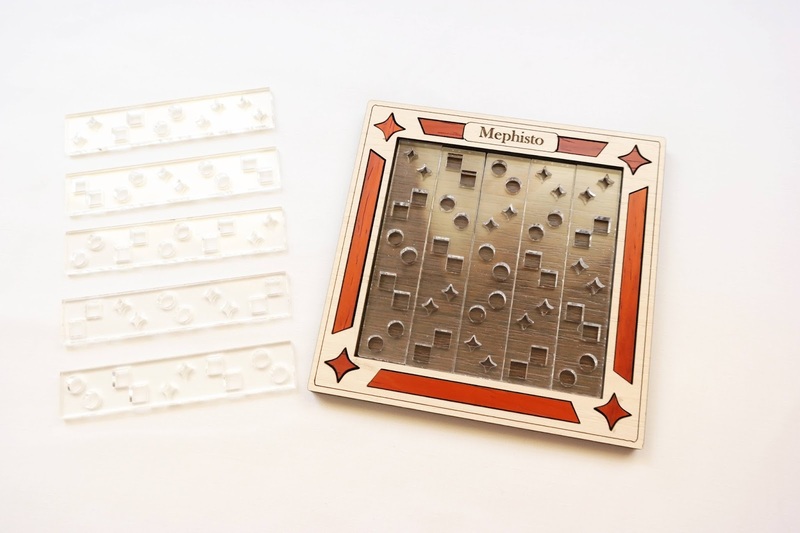 This puzzle is a really interesting and fascinating design. The perfect balance of materials, wood and acrylic, make it stand out among many other wooden puzzles and captivate your attention right away. 10 acrylic strips are lined up in two layers, five pieces each. One layer has vertical strips, the other horizontal, and each strip has four pairs of symbols. When perfectly combined, the puzzle displays four identical symbols for each of the 25 squares in a 5x5 grid. It's a very challenging and at times, frustrating task - definitely not for beginners. The puzzle has three different sets of symbols: stars, circles and squares. It would've been interesting to see more symbols, like five, for example: one for each individual square. Another, probably even more demanding challenge, would've been to have no identical squares with the same symbols on the same column or row. 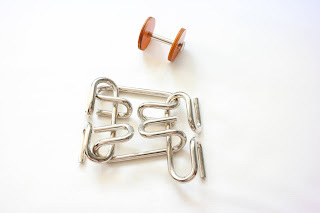 Since the puzzle is quite difficult as it is, maybe Jürgen went for a less complex design without making it impossible for the puzzler to solve it. After mixing the pieces it becomes extremely difficult to combine the right strips, so to solve it properly you have to use a "special" technique, which is very common in packing puzzles called "trial and error". Yes, there's no easy way to do this, so lots of patience and perseverance are needed in order to succeed. It took me over an hour to solve it. 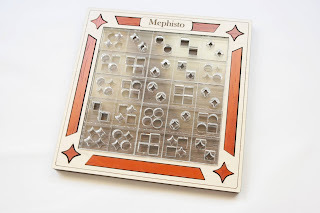 In the end, the Mephisto is totally worth your time, after all it's a fantastic puzzle and I enjoyed playing with it very much. It's a different kind of packing puzzle and may be of interest to anyone who enjoys puzzles, albeit a frustrating one. 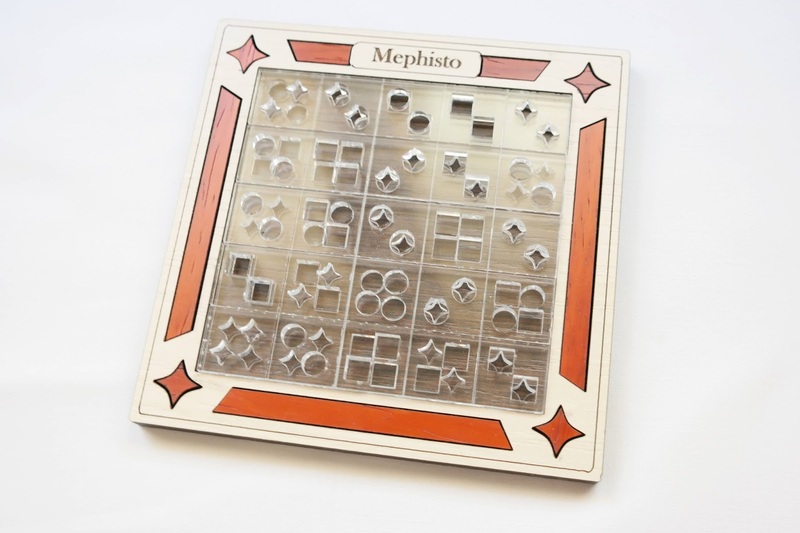 Availability: You can find the Mephisto puzzle at Brilliant Puzzles for $27.95. You can find here other Siebenstein puzzles as well. Ever since the original Rubik's Cube there have been so many variants that it would be a daunting task listing them all. From sticker variations to shape modifications, the possibilities are almost endless, and choosing the right one for you might be a rather difficult task. So, why not do it like me? Don't choose, collect all of them, or the most you can. The cube you see above is called the Feliks Pillow. 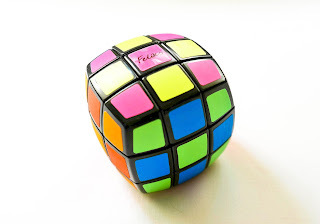 It's a slight shape modification of a regular cube, and the pillow shape is great to see five colors simultaneously. The internal mechanism is a little different from a standard 3x3x3 cube, with a spherical center core, and supposedly lets you do shortcuts, or corner-cutting, without popping. I'm not the best person to test this claim, since I'm not a speedcuber, but I trust its maker, Meffert's, as it can produce high quality puzzles. 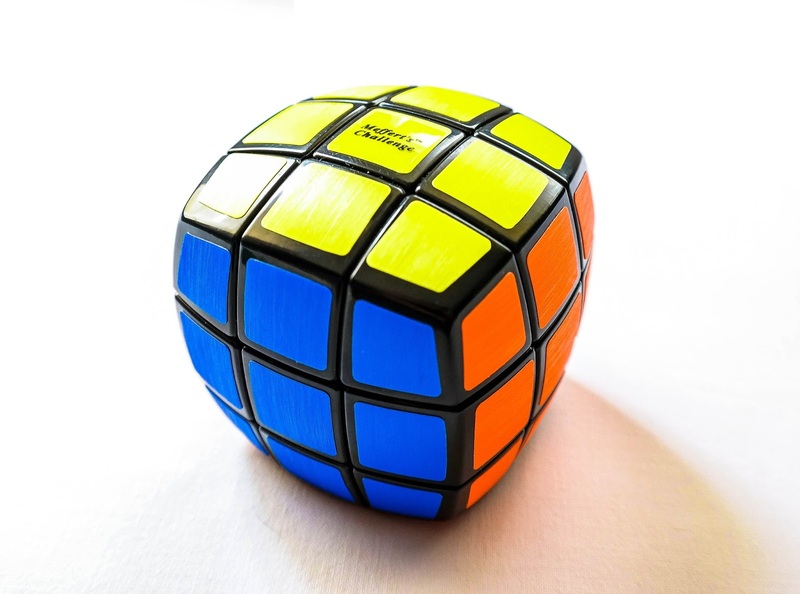 The design of the Feliks Pillow is a tribute to record holder Feliks Zemdegs, for solving a 3x3x3 cube. It was designed by Adam G. Cowan, and Meffert's started its production in 2011. The movement of the Feliks Pillow is very smooth - no need to apply extra lube. It feels great on your hands due to the slight spherical shape. It actually feels better than a regular cube. The stickers are the standard Meffert's color scheme, bright and fluorescent colors. I prefer the classic scheme - the Rubik's scheme - but it's nice to have variety, so I'm not too disappointed by that. 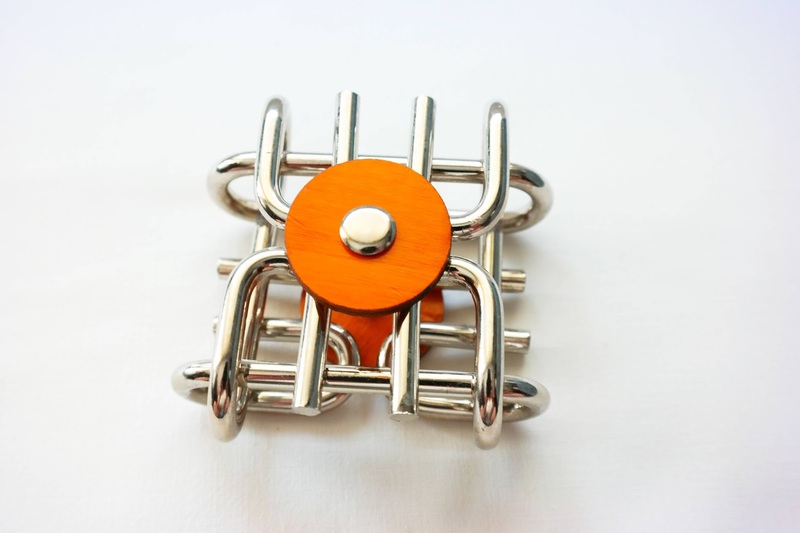 I do wish that the two orange tones used on this cube were a little different, though. When you're solving the puzzle in low light it can be a tad harder to distinguish both colors. Other than that, the puzzle is perfect and can be enjoyed by anyone. Whether you're a Twisty fan or a simply curious mind, the Feliks Pillow will surely please you. Its smooth turning and the different design approach to the classic cubic shape are more than enough reasons to give this one a try. Availability: The Feliks Pillow is available at PuzzleMaster for just $17.99 USD. Others from Meffert's are also available.